John Henry Knight produced an unsuccessful steam carriage in 1869. In 1895, he and George Parfitt built an internal combustion powered car. He was charged with driving a locmotive without a license on a public road and for failing to have a man with a red flag preceeding him. Knight was a founding member of the English Automobile Association and actively campaigned for repeal of the red flag laws. 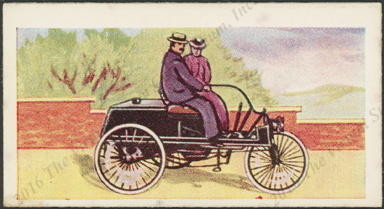 Robert R. Miranda, LTD, produced a series of 50 cards celebrating 100 Years of Motoring. 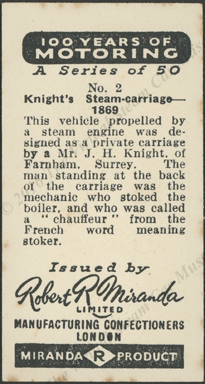 Among them are a number of steam cars, including J. H. Knight's 1869 Stean Carriage. 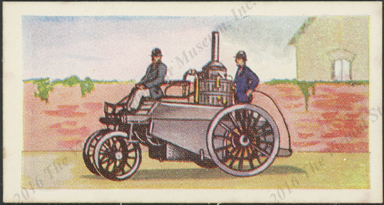 Robert R. Miranda, LTD, produced a series of 50 cards celebrating 100 Years of Motoring. 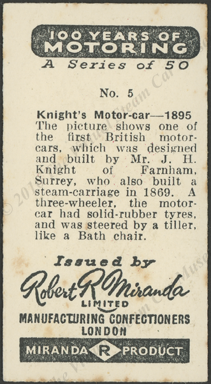 Among them are a number of steam cars, including J. H. Knight's Petroleum internal cumbustion car of 1895. See: Wikipedia, John Henry Knight. Contact us if you have additional information about J. H. Knight or if you have questions.